Cove Cottage is a three bedroom cottage situated in a quiet cobbled courtyard in Allonby, on the edge of the Lake District. It is only minutes away from the nearest Blue Flag beach. The cottage was converted from 250 year old farm buildings in the 1960’s, providing spacious and well equipped accommodation. 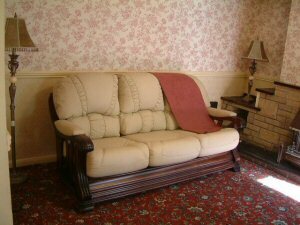 The cottage has been sympathetically decorated throughout, in the style of a traditional Victorian cottage. The spacious lounge has a gas fire within a feature fireplace, colour TV, video and CD/cassette player. In the dining room there is a beautiful old pine table and chairs. The lovely country kitchen has an electric oven, gas hob, microwave and washer/dryer. There is also a fridge and separate freezer. On the stair landing is a cosy seating area, where one can quietly read. There are three bedrooms on the first floor. The Master Bedroom, with a Victorian Antique Iron, Four Poster Bed. 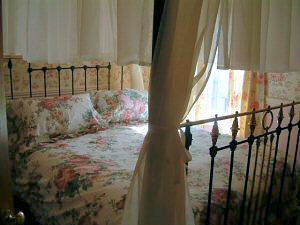 The Rose Room with a Victorian Antique Iron double bed. And the Blue Room with two Victorian Antique Iron single beds plus 2 extra properly sprung foldaway beds. All with beautiful period bedding. The bathroom has a power shower over bath, hand basin and toilet. To the side of the cottage is a small private walled yard with garden furniture. All fuel and power included in the price. Bed linen and towels provided free of charge. Cot (linen not provided) and high chair included. Double glazed and centrally heated throughout. With smoke alarms fitted for your safety, and all the modern conveniences you would expect.